For Randall Shelley, creating a mobile-friendly website wasn’t even a question. One of MPG’s biggest motivators was Google’s recent update of its algorithm to increase rankings for mobile-friendly websites. This means that websites with mobile compatibility will be given higher rankings in Google search results compared to websites with no mobile platform. “If you don’t have a mobile strategy, you don’t have a strategy for the Internet,” says Sharky Laguana, CEO and founder of Bandago Van Rental. As an independent rental company, where do you start when trying to go mobile? We talked to several independent rental companies — as well as technology experts — to get their insight. When it comes to Internet search, there are now more mobile users than desktop users. In the U.S., mobile digital media time (51%) is now higher compared to desktop media time (42%), according to the latest KPCB mobile technology trends report by Internet watcher Mary Meeker. As a rental company, do you want to miss out on mobile traffic, especially as it continues to increase? 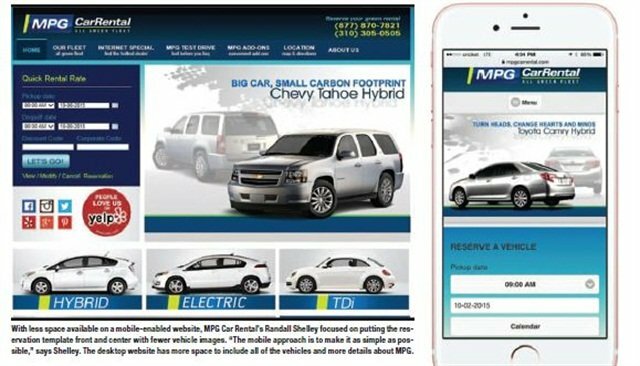 With less space available on a mobile-enabled website, MPG Car Rental’s Randall Shelley focused on putting the reservation template front and center with fewer vehicle images. “The mobile approach is to make it as simple as possible,” says Shelley. The desktop website has more space to include all of the vehicles and more details about MPG. As an independent, it can be difficult to know where to start and where to find the time when trying to develop a mobile strategy. Laguana refers to it as “a bandwidth problem.” Diving into mobile takes time — time that most small operators don’t have. One strategy is to hire an outside consultant. Website design companies can help a rental company create a compelling website, even when working with a smaller amount of real estate on a smartphone. Rental companies can also attempt to create a mobile-centric design on their own. For MPG, Shelley used programming tools in a content management system. Systems such as Joomla and WordPress.com provide tools to help you go mobile. To continually improve your mobile site, Shelley recommends Google’s PageSpeed Insights. Once you plug in your website, this tool provides a score of the user experience (mobile and desktop) and gives recommendations to help improve traffic. Hertz's NeverLost mobile app. Photo courtesy of The Hertz Corp.
At Hertz, about 40% of its traffic is now mobile. It’s where the majority of its growth is, according to Charlie Coniglio, Hertz’s vice president of customer relationship management and online marketing. The Hertz app stores loyalty member numbers, retrieves past receipts and looks up pending reservations, says Coniglio, who adds that more than 2 million users have downloaded Hertz’s app. As of summer 2014, Hertz’s NeverLost GPS system has been available as a mobile app. It features city guides with information on restaurants, local events, parks, tours and top spots, according to Hertz. Other helpful features include a weather icon, a map that provides both walking and driving routes and the option to post your location on Facebook or Twitter. Avis recently updated its mobile app by adding a voice feature. Now Avis Preferred loyalty members can make, confirm or cancel reservations via voice. The app speaks and displays car classes as well as the rental’s estimated cost, according to the company. Users can even use their voice to initiate a call to Avis customer service. An app could be beneficial for a rental company if it’s compelling enough for users to want to download, install and then use on a consistent basis. Allison suggests a loyalty program app as an example. Bandago’s Laguana recommends the following Internet/mobile strategy: 1) get a website; 2) make it mobile-enabled; 3) decide if you want a mobile app. So far, no independent rental companies have purchased the app service from Allison’s company. MPG Car Rental — like many independents — doesn’t want to invest the time and money on an app when it doesn’t seem like a necessity to its marketing plan. Apps aren’t cheap, especially if you want to reach Android and Apple users. If you only have an app compatible for Androids, you will only be reaching half of the market, according to Allen Darnell, chief technology officer for Silvercar. But if you design both types of apps, it costs twice as much to build. 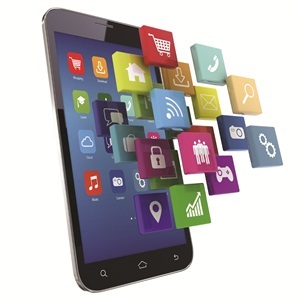 Mobile apps can go far beyond booking reservations. Some technology-based rental companies have put the app at the center of their user experience. Operating out of several residential complexes and hotels, mobile technology automates Shmuel Hazan’s carsharing operation — with no need for a counter. Cars by Hour customers download the app to register and reserve a vehicle. Then they can use the app — developed by JustShareIt — to unlock and lock the vehicle, according to Hazan. Hazan now wants to integrate JustShareIt’s software into his traditional car rental company, New Age Car Rentals. With the mobile software, customers would be able to download their rental contracts and view available vehicles on the lot — before coming into the office. Silvercar’s mobile app takes all the friction out of the rental car process: no waiting in lines, no counters, no upsells and no confusing insurance, according to Darnell. Plus, it unlocks and locks the vehicle. After completing your profile through the Silvercar app, it saves a customer’s information through the cloud. Currently, 55% of Silvercar’s bookings are completed through its mobile app, according to Darnell. FlightCar, a peer-to-peer carsharing company based at airports, launched its mobile app in July. Using a smartphone, customers can list or rent cars, view scheduled trips and even check the status of their car while away. The app also improves the pickup process. Once customers arrive at the airport, they can request a pickup through the FlightCar app. They can then specify their location and airlines as well as their party size and luggage needs. Like Uber, the FlightCar user is able to track the location of the driver via the app. To help the driver find them, users can even provide a general physical description through the app, such as the color of their jacket. 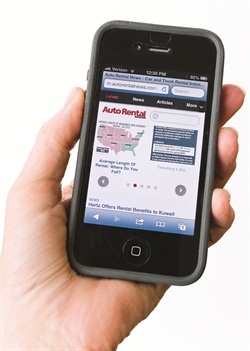 Auto Rental News' mobile-enabled website. Google’s PageSpeed Insights measures the performance of a page for mobile devices and desktop devices. Users start by entering their website’s URL into the program. According to the Google Developer’s online page, PageSpeed Insights retrieves URLs to analyze them as both a mobile and desktop site. The program assigns a PageSpeed Score of 0 to 100 points, with 100 the highest. A score of 85 or above indicates that the page is performing well. Google points out that PageSpeed Insights is being continually improved, which will change scores as it adds new rules and improves its analysis. Time to above-the-fold load equates to the elapsed time from the moment a user requests a new page to the moment the above-the-fold content (the portion of a Web page that is visible in a browser window when the page first loads) is rendered by the browser. Time to full-page load signifies the elapsed time from the moment a user requests a new page to the moment the page is fully rendered by the browser. Google says implementing PageSpeed Insights’ suggestions should improve the relative performance of the page. However, the absolute performance of the page will still depend on a user’s network connection. Our website, autorentalnews.com, is optimized for mobile interactivity. We ran the URL through PageSpeed Insight’s analyzer. Specific to speed, the page returned a score out 29 out of 100. Ouch! We were also told to “prioritize visible content” in the “consider fixing” category. Each of these suggested fixes came with links to pages with suggestions on how to fix the problems. When it came to “User Experience,” we scored 96 out of 100. Better!